The machinery called brake, used for slowing or stopping a moving vehicle, is of different types. Browse through this write up for various kinds of brakes used in vehicles. What is the point of owning your dream car, when it does not have brakes? Sounds strange, right! Though you would be able to start your car, what about slowing your vehicle or stopping it? Definitely, you sure wouldn’t want to go back to the era of when vehicles moved and stopped at the stroke of a whip. Talking of the present vehicle industry, brakes form the most important component of any vehicle. Used to slow or stop a moving vehicle, brakes are installed in all vehicles, whether they are automobiles, motorcycles, trains, or even airplanes. The friction generated by pushing the brake converts kinetic energy into heat, which causes the brake rod to move and stop the vehicle. Depending upon the vehicle type and desirability, brakes are grouped into different types. To know them, glance through the following lines. Invented by Frederick William Lanchester in 1902, disc brakes are considered to be the best type of brakes. They have a disc that is fitted behind the wheel. As the brake shoe is pressed, the disc is squeezed against the wheel, causing it to stop. It is generally a round, flat piece of metal made from cast iron. 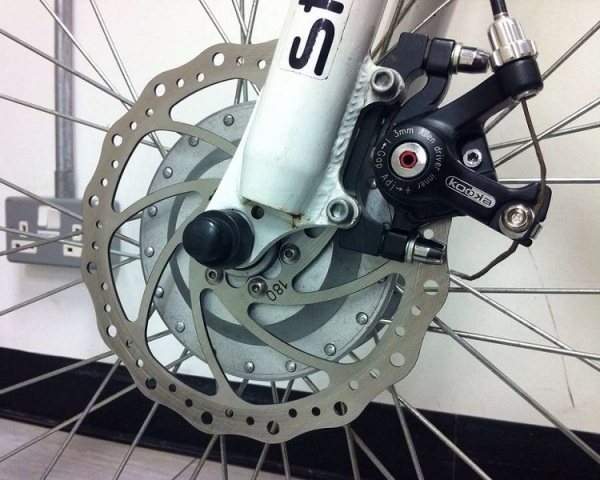 Disc brakes are popular mainly due to their durability, as they last for more than three decades. They are more effective than other types of brakes and work best on motorcycles, cars, and bicycles. Originally devised for use on trains, vacuum brakes work on the principle of creating air pressure changes in a compartment called brake cylinder. The brake cylinder consists of a piston that utilizes the force of incoming air to move the brake shoes through a rod. This happens due to pressing down the brake pedal that causes friction to move the brake rod. As opposed to disc brakes and air brakes, vacuum brakes take more time to show their effect. It is due to this reason that trains take considerably more time to stop when the brakes are pressed. Similar to vacuum brakes, drum brakes use oil pressure instead of air pressure as in the case with vacuum brakes. These were invented by Louis Renault in 1902. While the rod moves and causes the brake shoes to squeeze, friction is caused on a rotating drum that is attached to the wheel. The speed of the wheel can be controlled by stopping or slowing the drum. Drum brakes do not last longer and demand frequent replacing; hence, they are not much effective as compared to disc brakes. And for this reason, they are being replaced by disc brakes in most vehicles. Air brakes are used in two different mechanisms monitoring two different types of brakes. Firstly, they are applied in road vehicles, particularly in trucks and trains. They consist of either a disc or drum brake, but utilize compressed air instead of compressed liquid to create friction. Secondly, air brakes are also used in airplanes for slowing and monitoring the speed of the aircraft while in flight. Aileron is one such example of air brakes, that is, the surface that moves out from the plane to create more wind resistance.